FatCow shared hosting offers a good number of excellent features. The Original FatCow Plan is moderately priced, provides unlimited disk space, bandwidth, MySQL databases, subdomains, e-mail accounts, and sites hosted. Free extras include a domain name (first year only), a drag-and-drop site builder, and a good number of ecommerce options including a shared SSL certificate. What should have been a positive hosting experience was unfortunately ruined by reliability issues and slow page-load speeds. Most of the problems occurred on the very first day of testing. In summary, FatCow has earned the NCM Online designation of NOT RECOMMENDED. Most web hosts offer a number of shared plans — FatCow offers only one — the Original FatCow Plan. While priced slightly higher than most entry level plans, it provides everything required to build a personal or business website, including a number of ecommerce options. Unlimited features include bandwidth, disk space, domains hosted, e-mail accounts, MySQL databases, and subdomains. Free extras include a domain name (first year only), a drag-and-drop site builder, a range of website templates, and the MOJO Marketplace scripts and applications library. The Original FatCow Plan is backed by 24/7 phone, chat, and e-mail support, as well as a 30-day money-back guarantee. A green company, FatCow offices and datacenters are powered by 100% wind power. FatCow utilizes a fairly simple 2-step checkout process. Enter the domain name you wish to associate with the hosting account in Step 1. Enter your billing information and select a plan term to complete Step 2. However, FatCow automatically adds two optional “Website Essentials” to the shopping cart: “Advanced Site Protection and Performance Accelerator” at $1.25 per month, and “Automated Daily Backups” at $1.08 per month. The practice of automatically adding additional-cost options to the shopping cart is one which NCM Online strongly disagrees, and we will continue to point it out whenever and wherever we see it. Further, while FatCow does provide a link to the renewal rates from their homepage, the FatCow Original Plan page, as well as the hosting features page — the shopping cart does not. FatCow vDeck 4 Control Panel. Click to enlarge. We used the PayPal payment option to complete our FatCow hosting purchase. Three minutes after receiving the PayPal receipt, the “Welcome” e-mail arrived in our inbox. It provided all of the information required to set up our test site quickly including the nameserver (DNS) settings, FTP login info, and e-mail settings (click for sample test site). FatCow provides the user-friendly vDeck 4 control panel (screenshot right) with its shared hosting accounts. 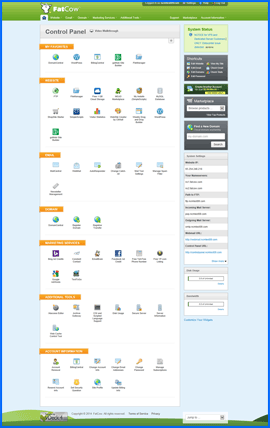 While not quite as extensive as the cPanel control panel, it is easy to use and provides direct access to numerous hosting functions. For WordPress and other CMS (content management system) installations, FatCow provides the MOJO Marketplace installer. While not quite as easy to use or as fast as the Softaculous apps installer, it does the job. We do however, take issue with the fact that it launches a pop-up ad while you wait for the installation to complete. 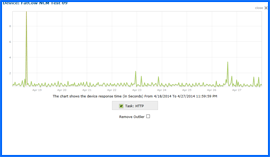 After uploading our NCM Test Site to the FatCow server, we set up Dotcom Monitor speed and reliability testing. All web hosting services reviewed by NCM Online are subjected to uptime and page-load speed testing. Beginning on 4/18/14 and concluding on 4/27/14, our FatCow-hosted website was checked for uptime and page-load speed every fifteen minutes. Nearly two thousand individual checks spread across thirteen locations worldwide were performed during the ten-day test period. FatCow Uptime Test Results Chart. Click to enlarge. Of the 983 uptime server checks performed, 972 were successful, while 11 failed (see uptime test results screenshot right). Locations that reported difficulty in accessing the test site included Colorado with 2 failures, and Minnesota, California, Florida, Texas, Montreal, Paris, Amsterdam, Frankfurt, and Hong Kong with 1 failure each. Server errors include DNS Error 12007 (hostname could not be resolved) as well as TCP Error 10060 (connection attempt failed because the connected party did not properly respond after a period of time, or established connection failed because connected host has failed to respond). Ten of the eleven uptime issues reported occurred on the very first day of testing, 4/18/14. 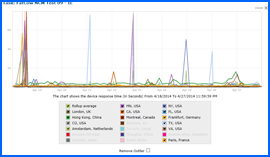 A single DNS error reported by the Colorado test location occurred on 4/22/14. Unfortunately, these errors lowered FatCow’s reliability score to 99.879%. Note that our London, New York, and Virginia test locations did not report a single uptime error. FatCow Speed Test Results Chart. Click to enlarge. Not only did the uptime issues negatively impact FatCow’s reliability rating, they also affected average page load speeds, which were less than impressive to begin with. On average the page load speed for our simple 1-page test site was painfully slow 2.7928 seconds across 13 test locations worldwide (see screenshot right). The 7 U.S. test locations averaged even slower page load speeds, recording an average of 2.9224 seconds for a browser to load our page. When all was said and done, FatCow produced the lowest speed test rating we have recorded to date — the absolute minimum of 0.5 stars. If we were to exclude the problematic date range (4/18/14 – 4/22/14) from our speed testing results, the page-load speed average across the 13 worldwide locations would be 1.7158 seconds for 4/23/14 thru 4/27/14. Excluding non-US test locations brings the average down to a less-than-impressive 1.3825 seconds for the 4/23/14 thru 4/27/14 date range. Despite a number of excellent hosting features, speed and uptime issues prevent us from endorsing FatCow at this time. FatCow has earned 3.5 stars and is not recommended by NCM Online. Cheap website hosting company price comparisons based on 1-year term list price before coupon/promo codes or limited time/introductory offer discounts. These are the renewal rates for the second year of hosting. To ensure that you receive the most affordable FatCow pricing possible, please visit our Web Hosting Coupon Codes page for current discounts and special offers before making any purchases. FatCow provides shared website hosting solutions for individuals and start-up to medium-sized firms seeking cost-effective hosting options. The firm was built from the beginning to be a new alternative for web hosting. The founders looked at the competition and saw many puzzling pricing schemes, tons of techno babble, and not much customer support or satisfaction. They made the decision to offer a clearer, more client friendly approach. FatCow began in 1998 and has grown through its commitment to providing courteous, old-fashioned customer service and the best values. The firm’s entire staff is focused on giving small business users the best customer support experience and the most for their money. They dedicate their efforts to making webhosting services easy to own and use, and to making the process fun. FatCow’s web hosting plan is a different animal. The company pioneered the one plan one price idea in order to simplify the process of getting individual or small business sites on the Internet. The company’s hosting plan immediately gives a client all that is required to stake out a spot on the net. FatCow operates through two data centers located in the vicinity of Boston, MA. These centers have a total area of over 2400 square feet and house thousands of servers and multiple Petabytes of storage. They have identical network equipment and architecture, operate on both A/C and D/C N+1 power, and are guarded by 24/7 security. FatCow’s secure and robust network has pooled servers. This allows almost any network server to access web files in order to respond to a request. The first machine available will be able to load a client’s web pages, resulting in fewer interruptions of service and quicker loading times than those provided by traditional web hosting infrastructures. Also, each machine is paired with an identical one that can take over seamlessly if the primary unit fails. The data from all of the units is also backed up on a separate group of storage units in order to prevent data loss as result of disk failure in the primary units. FatCow’s front-end network includes redundant routers connecting with many providers around the globe through the use of BGP. Site data is processed through load balancers and managed by premium quality servers that are divided into various application pools, including FTP, web, incoming mail, etc. This infrastructure allows each machine to be customized for the function it performs. The result is greater density per box and quicker, more dependable services. No pool lives completely on a single rack. Therefore, if one rack loses its switch or power, the entire service pool will not go down. The company offsets its energy use through the purchase of Renewable Energy Certificates (RECs). RECs represent the use of wind energy to reduce the quantity of electricity distributed through the energy grid that’s derived from fossil fuels. FatCow’s leadership decided to buy RECS because they wanted to go beyond the eco-friendly adjustments they had already made in their own lives and assist employees and employees in reducing their impact on the environment. A client that hosts through FatCow can say that their site is green. FatCow service and sale personnel is available at 1-866-544-9343 to assist customers in selecting web hosting plans that meet their specific needs. This video tutorial demonstrates the installation of WordPress on an FatCow shared hosting account using the vDeck control panel and the MOJO Marketplace applications installer.